Pittsburgh, PA (January 17, 2018) – The dynamic sibling team of Chairman Howard W. “Hoddy” Hanna, III and CEO Helen Hanna Casey is ranked #1 on the Power Brokers list of the most powerful and influential real estate brokerage leaders in the United States and Canada. The rankings are featured in the 2018 Swanepoel Power 200 (SP200) report released yesterday. “We are thrilled to learn of the #1 ranking on the 2018 Swanepoel Power 200 Power Brokers list. This is an especially great honor because it’s not based on sales units or volume alone. This report measures the impact we have on the industry, the power of our brand, and our sales associates and staff who make Howard Hanna who we are today,” said Helen Hanna Casey. 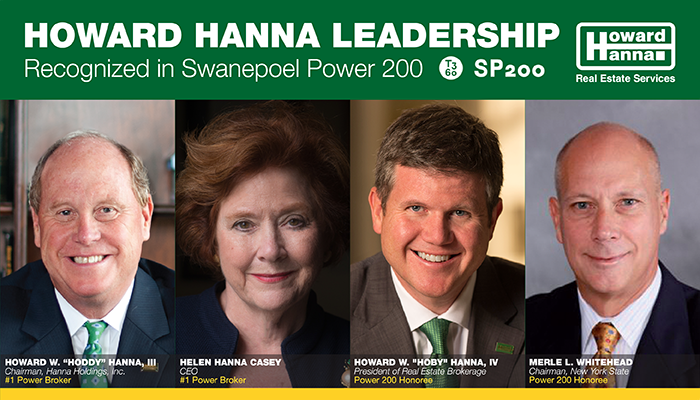 Third-generation Howard W. “Hoby” Hanna IV, President of Brokerage Operations in eight states, also ranks prominently on the 2018 Power 200 list as does Merle Whitehead, Chairman of Howard Hanna New York. Additionally, Helen Hanna Casey is the highest-ranking woman on the Powers Brokers list and is a continued standout on the list of Woman Leaders who have reached the highest levels of leadership, influence, and power in the residential real estate brokerage business. Published annually by T3 Sixty, the SP200 is the definitive ranking of the leaders and executives in the residential real estate brokerage industry. The SP200 team invests more than 400 hours analyzing hundreds of bios, annual reports and transaction and sales volume data. Howard Hanna Real Estate Services is the 3rd largest real estate company in America, the #1 privately owned broker in the nation, and the largest home seller in Pennsylvania, Ohio, and New York. The family-owned and operated real estate company specializes in residential and commercial brokerage service, mortgages, closing and title insurance, land development, appraisal services, insurance services, corporate relocation and property management. With 259 offices across PA, OH, NY, VA, MI, WV, NC, and MD, more than 9,000 sales associates and staff are guided by a spirit of integrity in all aspects of the real estate process. For more information, please visit: www.howardhanna.com or facebook.com/howardhanna. Congradulations! What a way to lead and inspire. Imagine, IF, the Hanna’s never thought of doing real estate… We are all so very fortunate to have such a family run company that believes in everybody, who works hard can achieve their goals in life, dreams, sustaining livelihoods and help others and ourselves altogether to think, build and manifest dreams. Never take for granted the opportunities that you can build together. CONGRATS to the Hoddy, Helen, Hoby, as well as all the Hanna’s (Bop Bop too) and Thank you Hanna Team, as well :). “Living the Dream Nano Second to Nano Second”.